Suri Cruise and Katie went on a safari ride in Aquila Game Reserve outside of Cape Town, South Africa on October 22nd 2013. Suri was wearing Pink Stripe Sequin Tee SS'13 by Crewcuts and Navy Floral Leggings by John Lewis Girl. outfit info: shoes by TOMS. 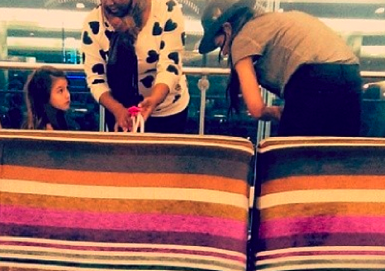 October 2013: Suri spotted in Cape Town, Africa!!! Wondering where did Suri go? Suri Ctuise & Katie were spotted by several twitter users in Cape Town, Africa. Katie is in South Africa filming new movie - "The Giver." Suri Cruise and Katie pictured arriving at the LAX airport on October 14th 2013. Suri was wearing Oso Pink Hoodie by The North Face. outfit info: skirt by gap, shoes by toms. Suri Cruise looks a bit sleepy while arriving to The Avenues School in NYC on Friday, October 11th 2013. Oso Pink Hoodie by The North Face and Black Suede Riding Boots FW14 by GAP. 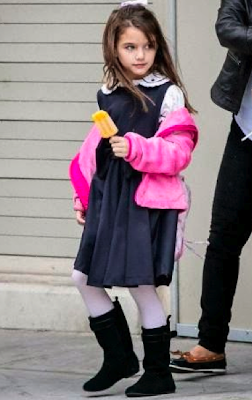 Suri Cruise looked adorable with her ice-cream after school in NYC October , 2013. Suri was wearing Navy Bow Dress FW13 by Oscar de la Renta, Black Suede Riding Boots FW13 by GAP. outfit info: Oso Pink Hoodie by The North Face. 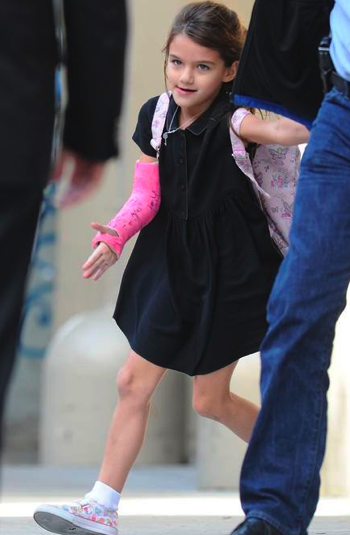 Suri Cruise skipping down the stairs after school in NYC on October 9th 2013. Suri was wearing Pink Loafers by Venettini and Oso Pink Hoodie by The North Face. Suri Cruise & Katie walked to the library in NYC on Tuesday, October 8th 2013. Suri was wearing Amber Black Ruffle Dress FW13 by Pale Cloud, (first seen on October 2nd 2013) and Mink Fur Vest FW'14 by Lanvin (first seen on September 18th 2013). outfit info: Gelato Shoes by Start Rite (first seen on September 16th 2013). You might also like >>> Vivienne Jolie Pitt wearing Pale Cloud on September 4th and September 28th!!! 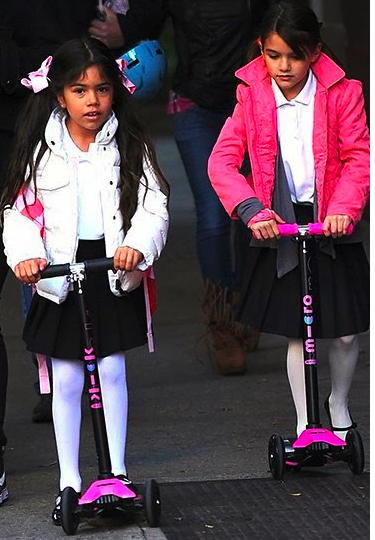 Suri Cruise was riding new Pink Maxi Micro Scooter to get to school in NYC on October 8th 2013. 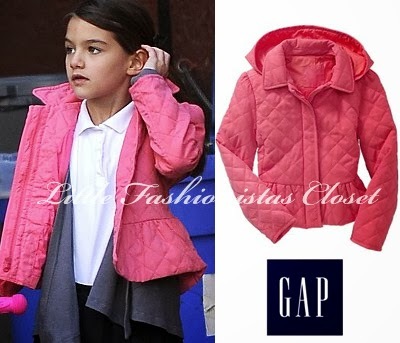 Suri was wearing Pink Quilted Peplum Uniform Jacket by GAP, Blue Wool Pleated Skirt FW13 by Gucci. In Suri's Closet - Pale Cloud! Suri Cruise looked classy wearing Amber Black Ruffle Dress FW13 by Pale Cloud to school on October 2nd 2013. Suri Cruise pictured on her way to The Avenues School on October 4th 2013.
outfit info: dress by crewcuts, shoes by bloch. Check out NEW: All For Children Unicef x H&M Halloween 2013 Collection! Suri Cruise hurried into The Avenues School in NYC on October 3rd 2013.
outfit info: uniform jumper, puma sneakers. Suri Cruise was spotted getting to and from The Avenues School on October 2nd 2013. 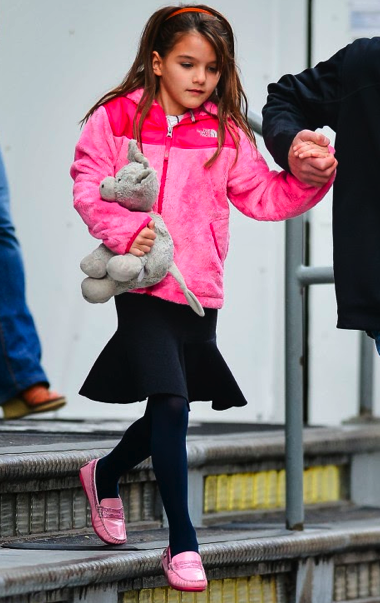 Suri Cruise was carried by Katie after school in NYC on October 1st 2013. 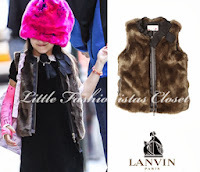 Suri was wearing Mink Fur Vest FW'14 by Lanvin (first seen on September 18th 2013) and Pink Tiara Shoes by Lelli Kelly. Suri Cruise pictured making her from The Avenues school to the awaiting car in NYC on September 30th 2013. Suri Cruise was wearing Maud Black Crepe Dress FW'12 by Bonpoint (first seen on March 5th 2013) Gelato Shoes by Start Rite (first seen on September 16th 2013).